Barry from Zombie Command gave us a heads-up of another Zombified Mickey Mouse spotting. The last time we saw Mickey was when Sideshow Collectibles released their Mickey VCD. This incarnation looks to be a Kubrick version but this is unconfirmed. 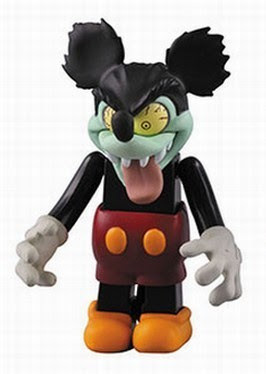 Technically, this isn't a zombie but a version of Mickey from the short, Runaway Brain. Still looks cool, though.